I always have to carry my Laptop along with me for my work. My laptop is so heavy that it’s very difficult to carry it in Metro and Buses. I have always been thinking of buying a new one and sell my old laptop. With time my laptop became slow and started giving me hardware related problems. Sometimes, I used to lose my data because of unexpected errors. I have been searching for a nice tablet or laptop for a long time but could not find one. If the configuration was good, the power backup was less. If the power backup was good, the configuration was not good. Most of them were heavy in weight. Light Weight: I have to carry my laptop in metro and buses. A heavy laptop makes me uncomfortable to carry it. A light weight laptop is always easy to carry when travelling. Good Configuration: A good configuration is very important. I work on various applications simultaneously. I need a good configuration so that I can run various applications simultaneously without making my laptop slow. A good processor and a good amount of RAM are very important for me. Good Power Backup: A good power backup is very important otherwise I will have to charge it again and again. A battery backup which would last for a long time is the right choice for me. Good Graphics: I sometimes, do animation and 3d modeling on my laptop so I need a nice graphics controller. A low graphics card will hang up my applications. I also play games with high end graphics. My search ended recently when I heard about ASUS EeeBook X205. 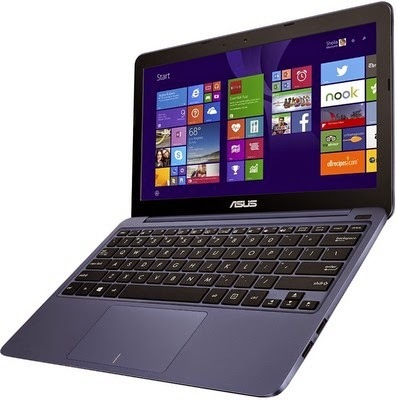 When I read the product specifications, I was very impressed and planned to buy ASUS EeeBook. The ASUS EeeBook X205 comes with Intel Atom Quad Core (4th Gen) Processor with a clock Speed of 1.33 GHz with turbo boost upto 1.83 GHz, 2MB Cache and with a memory size of 2GB DDR3 which is quite impressive. It comes with a screen size of 11.6 inches and a resolution of 1366 x 768 pixels powered by Intel HD Graphics. The battery is a 2 cell Battery and comes with a 33 W AC Adapter. It has Bluetooth v4.0, Wireless LAN IEEE 802.11 a/g/n, Built-in Speakers and a Built in Mic. It has a built in VGA Camera and comes with Chiclet Keyboard. The Hard Disks comes with a capacity of 32 GB EMMC. The product weight is 1 Kg and the Dimensions are 286 x 193 x 17.5 mm and Dark Blue in Color. The product comes with Windows 8.1, has 64-bit System Architecture and 32-bit OS Architecture. The product comes with 1 Year Warranty. All these features have influenced me to buy the new ASUS EeeBook X205.